Greek American lawyer is seeking compensation for Greek Cypriot refugees deprived from their rights to use and enjoy their property in the occupied part of Cyprus. Greek American attorney Athan Tsimpedes announced that he has submitted an appeal against Turkey and the illegal regime in the Turkish occupied north of Cyprus, in a federal court in Washington, on behalf of three Cypriot refugees, asking for compensation for deprivation of their property rights. 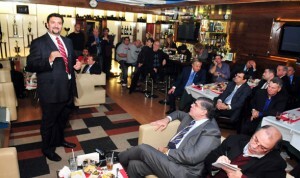 Lawyer Athan Tsimpedes speaks at the Pancyprian Lounge in Astoria. In a gathering in New York on Tuesday evening, Tsimpedes told Greek Cypriots the various aspects of the case, and urged those who have property or rights over property in the occupied areas, to take part in the appeal. “I have started this appeal to win and have no iota of pessimism”, Tsimpedes told the audience. He said he is using new elements in the case which are the exemptions of the US law of 1976 on diplomatic immunity, based on which it is possible to appeal in a US court against a foreign country in cases which concern commercial transactions. Tsimpedes said a similar case that fell through ten years ago, failed because it did not manage to associate the loss of use of property with the US. The commercial transaction between the US and Turkey, he continued, that took place in Washington, was the sale of American armament to Turkey that was used illegally, since the provisions were solely for defensive purposes. “There is no doubt about this sale of armament”, he said, noting that he will bring the illegal regime before the court. Tsimpedes said that the regime maintains offices in Washington and carries out commercial transactions. 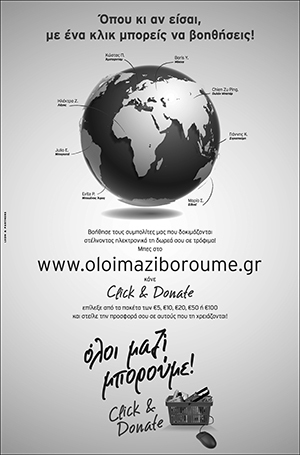 “They advertise the sale of Greek Cypriot properties all over the world and in the US. We will bring them before the court and make them answer how they have obtained the properties they are selling”, the attorney said. He also pointed out that the appeal submitted in the US concerns solely compensation for the loss of use of property rights and has no relation with the right of return of property or any other kind of compensation. In the event of a solution to the Cyprus issue, he added, the rights of the people will not be set aside because we represent people and not governments, the Greek American attorney pointed out. In his intervention, International Coordination Committee – Justice for Cyprus (PSEKA) President Philip Christopher described Tsimpedes’ approach as interesting. He said the appeal will definitely take years to try but it will help in informing the public opinion in informing on the violation of the property and human rights of Greek Cypriot refugees. Prior to the event, a fundraiser took place in support of congressman Michael Bilirakis. Addressing the gathering, the Greek American Republican Congressman said that himself along with other members of the Congress are making efforts to include positive wording for Cyprus in the bill before the Committee of Appropriations for foreign aid. Bilirakis pointed out the necessity for more Greeks living in the USA to be elected to Congress. President of the International Coordinating Committee Justice for Cyprus (PSEKA) Philip Christopher said Bilirakis was a courageous voice in Congress for Cyprus and other national issues. Christopher expressed hope that the Greeks and Cypriots abroad, as well as Cyprus, would benefit from the government of President Barack Obama and Vice President Joe Biden. He added that overseas Cypriots would continue their struggle for a solution of the Cyprus problem, noting that all solution plans presented have so far been in favour of Turkey. President of the Cyprus Federation of America Peter Papanicolaou praised the work of Bilirakis, noting that the overseas Cypriots should make sure he is reelected to Congress, because he was a strong supporter of Cyprus. President of the American Hellenic Educational Progressive Association (AHEPA) Nicholas Karacostas expressed appreciation for the work of Bilirakis, who is a member of AHEPA. Karacostas said he too was a refugee, from Kyrenia, and expressed hope that with Cyprus’ friends, in the Congress, such as Bilirakis, efforts for the return of the refugees to their homes would be successful. Previous article Onassis Exhibition "The Origins of El Greco"
Go Ahead Its About time the people Do somthing as Goverments are to Coward To take the problem at Hand and on the international platform America And England deliberatly put the Greeks in this situation Because we don’t play their game. Personaly I think A Second war Would solve the problem a lot more quickly and send them All back to where they come from. A sparten Queen said once real Men Are only born By Spartan Women I’m starting To belive She was right. No retreat No mercy. Dont Stop Till You win!! !